Ask any journalist her biggest pet peeve when dealing with brands, and she’ll probably tell you it’s PR teams’ spammy emails. We live in an increasingly sophisticated marketing world, but many PR and marketing departments still think a mass-emailed press release will earn them media mentions and industry credibility. This strategy will get your emails sent directly to the trash, not to mention drive many a PR-weary journalist to drink. Traditional press releases suffer from dwindling ROIs and short-lived impact, which is why brands need to amplify their voices through authoritative, resonant content strategies. Brands like Casper and Dollar Shave Club are getting personal with their content. They’ve hired in-house editorial teams to meet customers at their most intimate moments: in bed and in the bathroom. They’re endearing themselves to the public through unique and influential content, generating increased interest in their products. Once your audience has interacted with your content, it’s critical to follow up, continue to engage them, and help guide them through the funnel. Clayton Wood, CEO of Identity Labs, says his company has a two-hour response time. Placing original content with high-profile publications allows brands to differentiate themselves and position their companies as industry authorities. Sales teams can leverage bylined clips throughout the sales process, from initial outreach to prospect education. Potential clients are more willing to meet with you when they see that respected outlets have published your ideas. The sales team can use bylined articles to overcome prospects’ objections as well. When a potential customer expresses concerns about certain aspects of your product or service, a sales rep can point to content your company has published on the topic. Being able to respond to prospects’ reservations by showing them that you’ve validated your ideas on a third-party site goes a long way toward earning their confidence. Easily digestible content such as infographics quickly engages early-stage prospects. 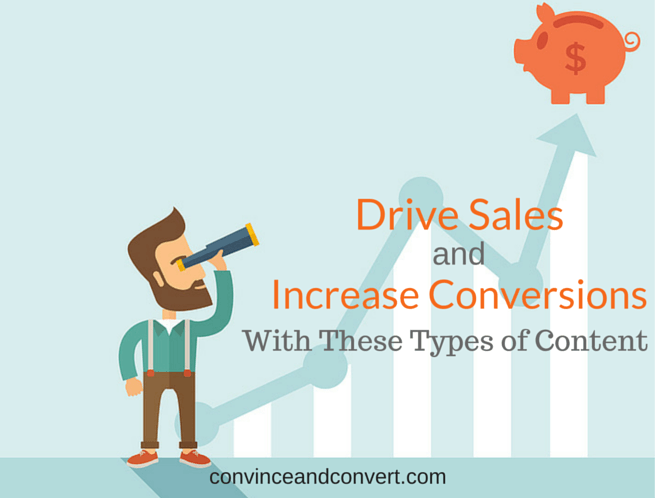 Once you’ve captured their interest, you can push them deeper into your inbound marketing and sales funnel. As with bylined content, sales teams can use whitepapers at multiple points in the conversion process. Whitepapers prove especially useful during the follow-up stage, when sales representatives want to demonstrate that your team is expert enough to handle leads’ accounts. These are also helpful for establishing credibility, demonstrating value to leads that have cooled, and educating prospects on the finer points of your offer. Once prospects have passed the discovery phase, they want to see objective examples of how your product or service will benefit them. Case studies enable sales teams to give prospects that proof by offering examples of success with similar companies. This type of content builds clients’ trust and earns their full buy-in, not just a tentative agreement to try it and see. Marketing and sales should work hand in hand on content strategy. The marketing team creates the content, but the sales department adds valuable input on what types are most effective at engaging and converting prospects. The two teams bring distinct viewpoints and approaches to content, and that’s a good thing. Together, marketing and sales can identify which publications prospects actually read, not just the ones that sound impressive. They know which tones turn people off and which play best among hesitant customers. They’ve seen how clients respond to content at different points in the process and how their experiences complement one another. By working together, they can create powerful content strategies for the entire funnel. 1. Create a process to develop and integrate content. The two departments should work out an ongoing schedule for analyzing content performance using a data spreadsheet or analytics template. Then, they can present a more unified customer experience throughout the conversion process. 2. Actively push content to the sales team. Your marketing team should update sales as new thought leadership articles and case studies are published and infographics go live. Equip your sales team with the most up-to-date content you have. 3. Educate your sales team on how to use it. Don’t just throw content at your sales reps and leave them hanging. Highlight the main themes in your bylined articles, explain the details in your case studies and whitepapers, and put your infographics into context. This prepares sales team members to answer prospects’ questions and makes for a more cohesive public message. 4. Revisit wins across the team on what content is succeeding. Schedule regular powwows to discuss which pieces are home runs with prospects and which leave them feeling uninspired. Update your strategies based on the sales team’s feedback. 5. Rinse and repeat with winning content. Once you find something that works, build on it. Sales provides powerful insight into what makes customers tick — especially once they’re deep in the funnel. Marketing should let that guide the content creation process. The two departments should have active, ongoing conversations about how to effectively utilize content and where the biggest lead generation and nurturing wins have occurred. Content has the power to intrigue, educate, and ultimately convert prospects to your brand. Although content creation is typically marketing’s domain, the sales team makes a powerful ally in maximizing your content’s reach. By collaborating with the sales department, you can create compelling content and drive your conversion rates to record highs. Ryan O'Connell is the Vice President of Influence & Co., a company that specializes in expertise extraction and knowledge management that are used to fuel marketing efforts.